Are Greek local governments moving towards e-government 2.0 model? What are the factors that impact adoption of Web 2.0 tools? What is the effectiveness of these tools in terms of citizens’ awareness, interest, and engagement? The present study addresses these questions by investigating the usage and effectiveness of Web 2.0 applications employed by the 325 Greek local governments. Results indicate that local authorities in Greece are moving towards an e-government 2.0 era, albeit slowly. Local governments originating from municipalities with a large number of educated inhabitants who have made use of e-government services are more likely to be adopters of Web 2.0 tools. In addition, findings suggest that Greek citizens are beginning to be more aware of the Facebook pages of their local governments while they seem more interested in their YouTube channels. Hopefully, local governments can increase their citizens’ engagement by being active on Facebook. 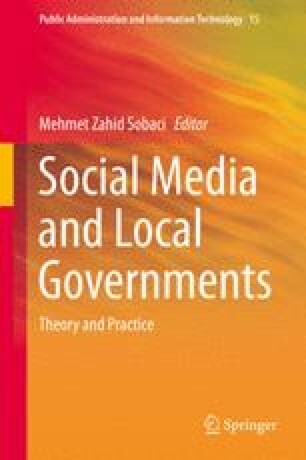 Officials of local governments should increase their presence on social media such as Facebook and YouTube but their strategies should be differentiated for each social medium in order to benefit from their potential. This research has been co-financed by the European Union (European Social Fund—ESF) and Greek national funds through the Operational Program “Education and Lifelong Learning” of the National Strategic Reference Framework (NSRF)—Research Funding Program: ARCHIMEDES III. Investing in knowledge society through the European Social Fund. Baum, C., & Di Maio, A. (2000). Gartner’s four phases of e-government model. Retrieved August 8, 2014, from http://www.gartner.com. FocusBari (2014). WEBID survey. Retrieved August 8, 2014, from www.focusbari.gr/media-research/internet-web-id.html. Larsson, A. (2013). Bringing it all back home? Social media practices by Swedish municipalities. European Journal of Communication. doi: 10.1177/0267323113502277.